In mid-November 1861 Opoethleyohola, a chief of the Creek tribe, along with about 5,000 men, women and children, departed their homes and moved northwest to isolate themselves from the growing conflict. His band consisted largely of Creek and Cherokee families, along with a few Seminoles led by Billy Bowlegs and Alligator. Although the group opposed secession, it did not actively support abolition and other unionist policies. In fact, some of the families in Opoethleyhohola’s following were slave owners and brought their slaves with them, but there also were some freedmen among the refugees. Disagreements within the tribes were not so much connected with the national issues as they were with old quarrels related to the removal treaties. As politics became factionalized, the old vendettas reared their ugly head. Opoethleyohola had long been at odds with Daniel and Chilly McIntosh, two other Creek chiefs, who believed Opoethleyohola was responsible for the murder of their father in one of the many assassinations surrounding the removal treaty signing. The McIntosh brothers were responsible for doling out the federal annuities and had been accused of shorting Opoethleyohola for many years. Deep-seated resentments such as those made negotiation of politics concerning the national issues almost impossible. 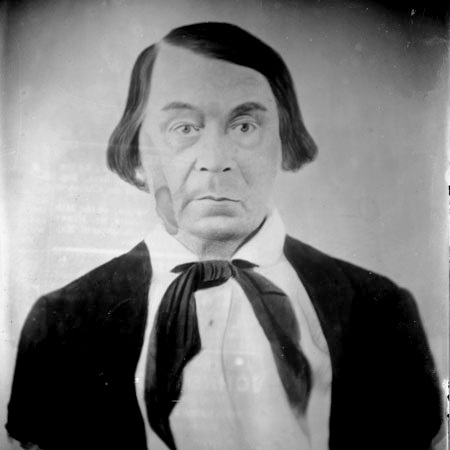 Douglas H. Cooper, a former United States Indian agent and veteran of the Mexican War, was second in command of the Confederate Indian regiments and had tried to negotiate with Opoethleyohola. Pro-Confederate Indian leaders convinced Cooper that Opoethleyohola was a threat and must be chased from the Indian Territory. Opoethleyohola had been in contact with the United States Indian agent E. H. Carruth who had promised federal support from Kansas, but there is no evidence of support for the refugees. So with about 2,000 troops from his Indian regiment, Cooper began pursuit. Some left Buck Creek in the Choctaw Nation while others departed from Fort Gibson and Boggy Depot. Cooper proceeded north across the Canadian and North Canadian Rivers. Scouts and spies kept a close eye on Opoethleyohola’s band and informed Cooper of their location. Concerned with the reported large numbers of Opoethleyohola’s followers, Cooper rendezvoused with the Ninth Texas Cavalry which was heading north into Missouri. The Texas troops were well drilled and anxious to try their military skills. When they arrived, the enthusiastic Indian troops greeted them with traditional songs and dances. However, their painted and undisciplined appearance gave the Texans little faith in their military expertise. One Texan remarked, “If there is an enemy near at hand our Indian brethren will certainly be cut up – have so little order. Two hundred well armed men can rout the whole rabble.” With the alliance set and anxieties high, they proceeded toward Opoethleyohola’s camp near the Creek Council at Thlobthlocco. 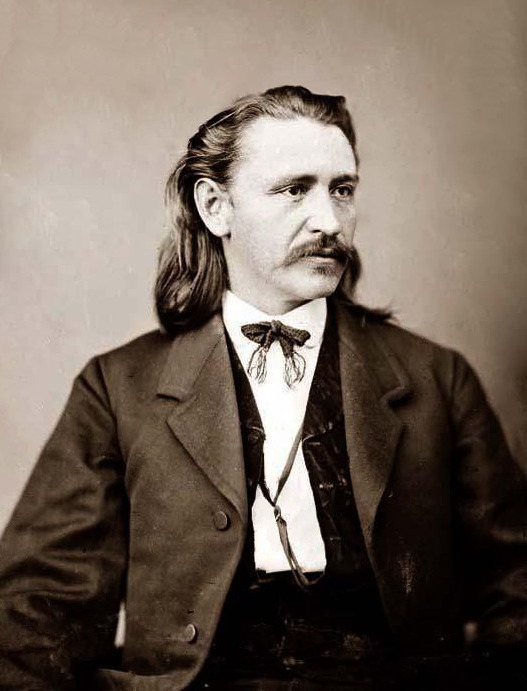 Opoethleyohola, who also was known as Gouge, learned of the Confederate pursuit and his followers began to fire the prairies as they moved north to Big Pond near the headwaters of the Deep Fork of the Canadian River. By burning the prairies and crops as they went, the deprived the pursuing Confederates of necessary forage and effectively slowed their pursuit. 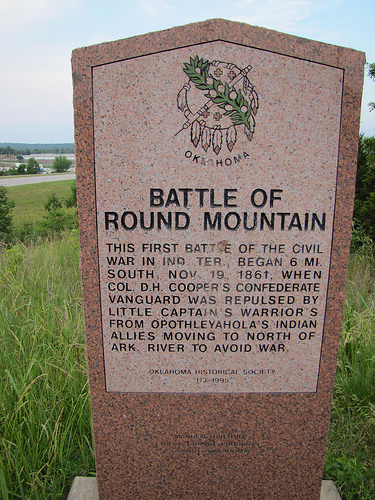 On the late afternoon of 19 November the forward elements of Cooper’s column made contact with Opoetheyohola’s lookouts or pickets a few miles north of Red Fork near a place called Round Mountain. The Texas troops gave chase. The Indian pickets fired the prairie as they went and led the Confederates into a timber-lined, horseshoe-shaped prairie where they received a welcome of hot lead and flying arrows. Surprise, smoke, and darkness added to the confusion of battle. The Battle of Round Mountain, the first engagement of the Civil War in the Indian Territory, must have completely surprised the Confederates. To be led into an ambush by a bunch of refugees must have been a blow to their confidence. Forced to retreat from their first real fight, the Confederates were determined to re-engage the enemy at first light. Pursuing the trail, Cooper’s troops came into Opoethleyohola’s hastily abandoned camp to find wagons, oxen, a few head of beef, some jaded ponies, and some of their own men, who were dead. Reassessing his position and the condition of his men and horses, Cooper decided to move east, first to Concharta then south to Tullahassee Mission, to recuperate. There also had been some saber rattling by Federal troops in Missouri which caused Gen. Ben McCulloch to alert Colonel Cooper that his troops might be needed to help defend northern Arkansas. 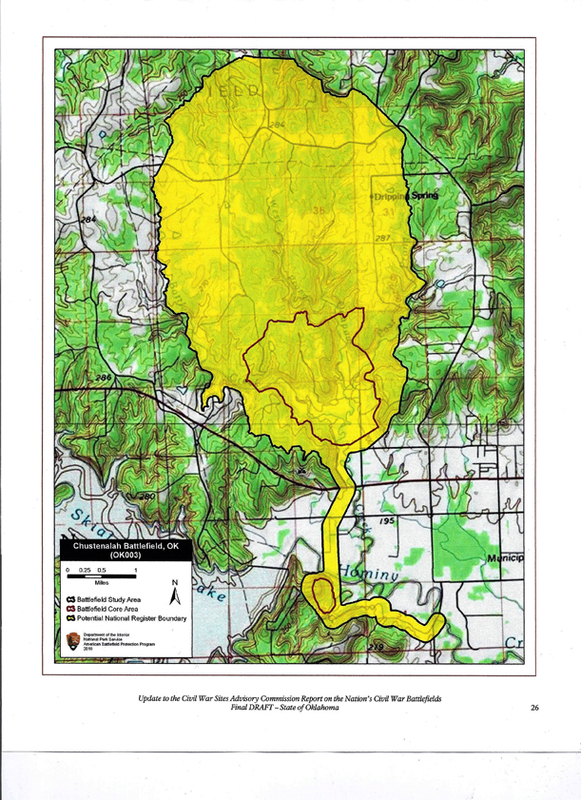 The location of the Round Mountain battle is still unknown. There are two theories that abound – one denoting the location near Yale, Oklahoma and the other near Keystone, Oklahoma. Both are plausible but no proper archeological survey has been conducted as of this date. For a good paper on the state of the debate, consult the Chronicles of Oklahoma article here. Description: Col. Douglas H. Cooper, Confederate commander of the Indian Department, had not been able to reconcile differences with Chief Opothleyahola, who commanded a band of Unionist Creeks and Seminoles. Cooper set out on November 15, 1861, with about 1,400 men to either compel submission . . . or “drive him and his party from the country.” His force rode up the Deep Fork of the Canadian River towards Chief Opothleyahola’s camp which they found deserted. On the 19th, Cooper learned from captured prisoners that part of Chief Opothleyahola’s band was at the Red Fork of the Arkansas River, where they were erecting a fort. Cooper’s men arrived there around 4:00 pm and ordered a cavalry charge which discovered that Chief Opothleyahola’s band had recently abandoned the camp. The Confederates did find some stragglers beyond the camp and followed them, blundering into Chief Opothleyahola’s camp. The Federals fired into the Rebel cavalry and, in large force, came out to attack them. They chased the Confederates back to Cooper’s main force. Darkness prevented Cooper from attacking until the main enemy force was within 60 yards. A short fight ensued but Chief Opothleyahola’s men broke it off and retreated back to their camp. Cooper set out for Chief Opothleyahola’s camp the next morning but found it gone. The Confederates claimed victory because Chief Opothleyahola had left the area. This was the first of three encounters between Chief Opothleyahola’s Union bands and Confederate troops. The chief was forced to flee Oklahoma for Kansas at the end of the year. Having exhausted every means in my power to procure an interview with Hopoeithleyohola, for the purpose of effecting a peaceful settlement of the difficulties existing between his party and the constituted authorities of the Creek nation, finding that my written overtures, made through several of the leading captains, were treated with silence, if not contempt, by him, and having received positive evidence that he had been for a considerable length of time in correspondence, if not alliance, with the Federal authorizes in Kansas, I resolved to advance upon him with the forces under my command, and either compel submission to the authorizes of the nation or drive him and his party from the country. Accordingly, on the 15th day of November last, the troops, consisting of six companies of the First Regiment Choctaw and Chickasaw Mounted Rifles; a detachment from the Fourth [Ninth] Regiment Texas Cavalry under Lieutenant-Colonel Quayle; the Creek regiment, under Col. D.N. McIntosh, and the Creek and Seminole battalion, under Lieut. Col. 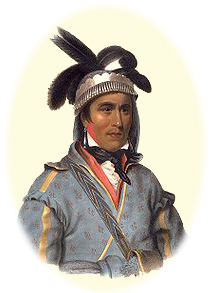 Chilly McIntosh (the Creek war chief), and Maj. John Jumper (Chief of Seminoles), in all about 1,400 men were moved up to the Deep Fork of the Canadian towards the supposed camp of Hopoeithleyohola’s forces. The camp, which had been abandoned, was found, and the trail from it followed, with varied prospects of success, until the 19th of the month named, on which day some of the disaffected party were seen and a few prisoners taken. From those prisoners information was obtained that a portion of Hopoeithleyohola’s party were near the Red Fork of the Arkansas River, on their route towards Walnut Creek, where a fort was being erected, and which had for some time been their intended destination in the event of not receiving promised aid from Kansas before being menaced or attacked. After crossing the Red Fork it became evident that the party was near and the command was pushed rapidly forward. About 4 o’clock p.m. some camp smokes were discovered in front a short distance and the enemy’s scouts seen at various points. A charge was ordered to be made by the detachment of Texas cavalry, under command of Lieutenant-Colonel Quayle, upon the camp, which, however, was found to have been recently deserted. Other scouts, being discovered beyond the camp, were pursued by the Texas troops about 4 miles, when they disappeared in the timber skirting a creek, upon which it was afterwards ascertained the forces of Hopoeithleyohola were then encamped. While searching for the fugitives the troops were fired upon by the concealed enemy, and 1 man was killed. The enemy immediately appeared in large force, and our troops, rallying and forming, succeeded in making a stand for a short time, when the efforts of the vastly superior force of the enemy to outflank and inclose them caused them to retire. During the retreat towards the main body of our forces a constant fire was kept up on both sides. Many of the enemy were killed, and on our part 1 officer and 4 men and 1 man wounded. So soon as the firing was heard at the position of the main body the Choctaw and Chickasaw regiment was formed and advanced towards the enemy. The exceeding darkness of the night rendered the relative position of our friends and foes uncertain and restrained the firing on our part until the enemy was within 60 yards of our line. Even then the order to fire was withheld until Col. James Bourland, of Texas (my volunteer aid on the occasion), and myself rode to the front, and the former called to those approaching, asking if any Texans were there, which was answered by the crack of the enemy’s rifles. A brisk fire was then opened by companies I and K, under Captains Welch and Young, and by companies D, E, and G, under Captains Hall, Reynolds, and McCurtain, as they successively took position After a short but sharp conflict the firing of the enemy ceased, and under cover of the darkness he made good his retreat. About 50 Choctaws and Texans were then sent out, under Actg. Asst. Adjt. Gen. R.W. Lee, to examine the ravine in front and on the flanks, when it was found that the enemy had left the field and retreated in the direction of their camps. During the action the line was re-enforced by portions of Captains Brinson’s, T.G. Berry’s, J.E. McCool’s, and Stewart’s companies, of the Texas regiment, under Lieutenant-Colonel Quayle, and by a few Creeks, under Lieut. Col. Chilly McIntosh, Captain Severs, and Lieutenant Berryhill. In the last encounter we had 2 men severely wounded and 1 slightly. Many horses were shot. Our men escaped mainly in consequence of being dismounted and by firing either kneeling or lying down. Our entire loss in the engagement was 1 captain and 5 men killed, 3 severely and 1 slightly wounded, and 1 missing. Prisoners taken since the battle concur in stating the loss of the enemy to have been about 110 killed and wounded. Soon after daylight on the 20th the main camp of the enemy was entered, and it was found that they had precipitately abandoned it, leaving behind the chief’s buggy, 12 wagons, flour, sugar, coffee, salt, & c., besides many cattle and ponies. Hopoeithleyohola’s force in this engagement has been variously estimated at from 800 to 1,200 Creeks and Seminoles and 200 to 300 negroes. The conduct of both officers and men within the scope of my observation was marked by great coolness and courage. I would particularize as worthy of high commendation the conduct of Col. James Bourland (who kindly volunteered his valuable services on this occasion and at other times); Actg. Asst. Adjt. Gen. R.W. Lee; Maj. Mitchell Laflore; Lieut. Joseph A. Carroll, acting adjutant Choctaw and Chickasaw Mounted Rifles; Lieutenant-Colonel Quayle and Captains Brinson and McCool, of the Texas regiment; Captain Severs, of the Creek regiment; Lieut. Col. Chilly McIntosh, Creek battalion; Lieut. Samuel Berryhill, of the Creek regiment, and Maj. J. Jumper, Seminole battalion. The promptness with which the Choctaws and Chickasaws came into line and the steadiness with which they maintained their position during the entire action merit unqualified praise, especially when it is considered that the night was extremely dark, the number and position of the enemy uncertain, and that they stood for the first time under an enemy’s fire. The following is a list of the killed and wounded: W. J. Lyttle, Captain Welch’s squadron Choctaw and Chickasaw regiment, severely wounded; Daniel Cox, Captain Welch’s squadron Choctaw and Chickasaw regiment, slightly wounded; Capt. C. S. Stewart, Texas regiment, killed; John H. Crow, Texas regiment, killed; ______Reed, Texas regiment, killed; _______ Jackson, Texas regiment, killed; John Friend, Texas regiment, severely wounded; ______ Smith, Creek regiment, killed; ________ Smith, Creek regiment, severely wounded; one killed, name not reported. In consequence of notice received from General McCulloch that Fremont was at Springfield with a very large force; that his advance guard had marched, and that probably his main body would move South the next day; that he (General McCulloch) would obstruct the roads and fight from the line down, but might be obliged to fall back to Boston Mountains, and he having directed me to take position near the Arkansas line, so as to co-operate with him, in connection with the fact that the forage of the country had been destroyed by the enemy and the horses of my command worn down by rapid marches, it was considered improper to pursue the enemy farther, and I returned with the troops to my train at Concharta, which was reached on the 24th of November, 1861. Information being received at this time that the anticipated attack upon General McCulloch had been averted by Fremont’s retreat, and that Hopoeithleyohola, with his forces, had taken refuge in the Creek country by invitation of the a leading disaffected Cherokee, it was considered unnecessary to take post near the Arkansas line (as directed by General McCulloch), but proper to prosecute the operations against Hopoeithleyohola without delay and with the utmost energy, which I accordingly proceeded to do. After a few days’ rest and preparation the forces under my command at Spring Hill¸ near Concharta, consisting of 430 rank and file of the Choctaw and Chickasaw Regiment Mounted Rifles¸ under Maj. Mitchell Laflore; 50 men, under Capt. 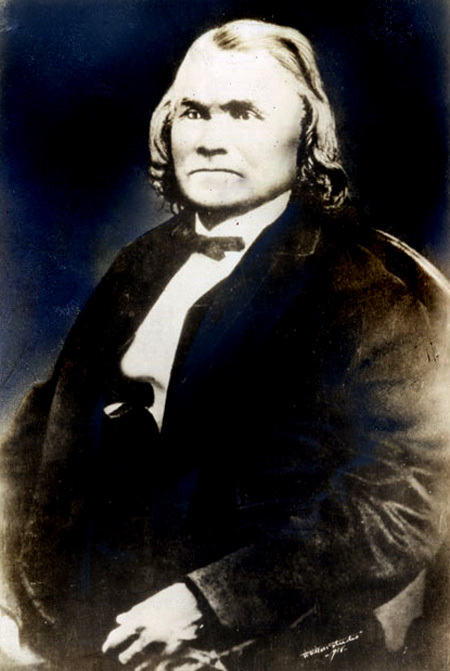 Alfred Wade, Choctaw battalion; 285 men of the First Creek Regiment, commanded by Col. D.N. McIntosh, and 15 Creeks, under Capt. James M.C. Smith – in all 780 men – were put in motion on the 29th of November in the direction of Tulsey Town, and Colonel Sims, who had gone with the sick of his regiment to Tallahassa, Mo., with all the available force of the Fourth Texas Cavalry, was ordered to move up Verdigris River in the direction of Coody’s settlement, where Col. John Drew, with a detachment of his regiment about 500 strong, was then posted. At Tulsey Town information was received from a prisoner escaped from Hopoeithleyhola’s camp that an immediate attack was intended by the enemy, 2,000 strong. Colonel Drew was ordered to march from Coody’s and form a junction with my command somewhere on the road to James McDaniels’. Colonel Sims, then at Mrs. McNair’s, on Verdigris, was ordered to join me at David Van’s. From some misunderstanding Colonel Drew marched direct to Melton’s, 6 miles northeast from Hopoeithleyohola. 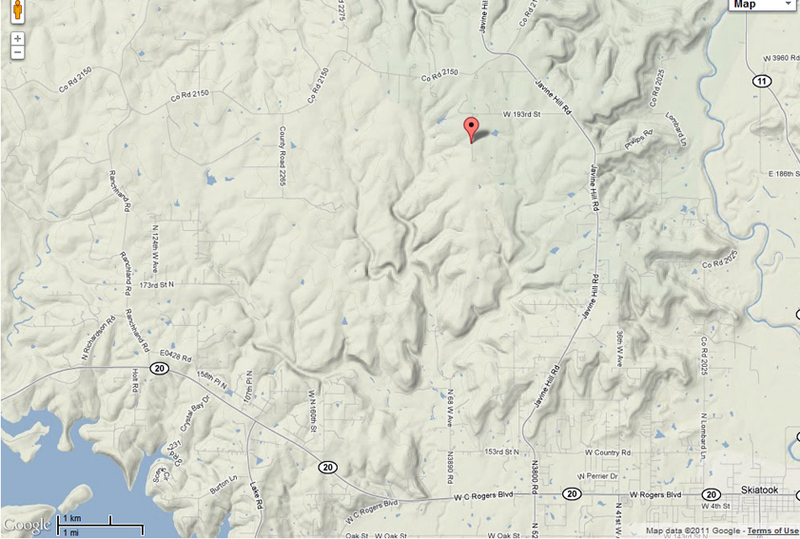 While following the direction contained in his reply I marched north from Van’s to Musgrove’s, on Caney. Thus he arrived in the immediate vicinity of the enemy twenty-four hours or more in advance of the main body. The attack was brought on by the second squadron about sunset, composed of about 70 men. I was promptly aided on my right by Captain Berry and on my left by Captain McCool, who formed in my own, or second squadron. After firing from three to five rounds I perceived the enemy in strong position and force, numbering some 1,500 Indians, and flanking my small force upon the right and left, I had necessarily to fall back to the main command, some 2 ½ miles, under a heavy retreating fire. The whole command – in which I fought my own squadron, Captain Berry’s company, a part of McCool’s, and a part of Captain Williams’ company – I am confident did not amount to exceeding 150 men. In my own company I regret to have to report the loss of John H. Crow, a private, killed. None wounded. One horse, 1 gun, and 5 powder-flasks losts. Reports of Capt. R. A. 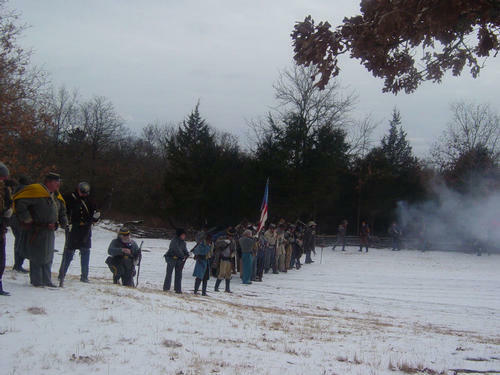 Young, First Choctaw and Chickasaw Regiment, of engagement at Round Mountain. COLONEL: On the 19th instant, a little after night-fall, we were ordered to saddle up and mount our horses, and the order was given to march. After marching 200 or 300 yards we were ordered to halt and form, which we did, and then advanced [to with] in about 150 yards of the enemy and dismounted. While dismounting we were fired on and 2 of our horses shot. My men dismounted in good order, and I ordered them to advance and fire. We advanced 8 or 10 paces from our horses and fired, the enemy keeping up a constant fire on us. We loaded and fired the third time and silenced the enemy’s guns. The prairie was on fire on my right, and as we advanced to the attack I could see very distinctly the enemy passing the fire, and I supposes a large body of men (200 or 300), but they were about 300 yards from me and the prairie was burning very rapidly, and I may have taken the motion of the grass for men. I lost 6 horses in the fight; those that were not mortally wounded stampeded, and we could not find them next morning. I suppose the engagement lasted fifteen minutes. Capt., Comdg. Co. K, 1st Regt. C. and C. Mounted Rifles. We found the enemy in considerable numbers, supposed to be 1500 strongly posted. We were fired upon by them, and formed as quick as the circumstances of the attack would admit, and returned their fire until it was evident that they were attempting to surround us, which their numbers and position enabled them to do. I thought it best to retreat, and were followed by the enemy nearly 2 miles, returning their fire as we went, until we were reinforced by [Col.] Cooper. We had scarcely formed when we heard firing ahead but it was now so dark we could not distinguish an Indian from a white man at three paces. It was therefore deemed most advisable for us to remain as we were for a time at least and await events. The Choctaws had been formed on our left and rather in advance of us. By the light of the prairie burning some half mile in front of us we could see their passing. Our men ran into an ambush where they were fired on in front and on both flanks. The Creeks fled and left the Texans to take care of themselves. Our loss was 6 killed and 4 wounded. Ordered to sleep on our arms. By daylight all men mounted and ready for march. Determined to pursue the enemy in Potheohola’s [Opothleyohola] camp found two of our men taken prisoner by them and beaten to death. Burned 15 to 20 wagons with their contents left by old Gouge. The advance finds & drove in their pickets, the command divides, charge about five miles, find the position evacuated & keep a furious rate 3 miles to Round Mountain Creek where they were posted in a horseshoe of timber…when within 100 yards the enemy tried to stampede us by sending dogs through our ranks. When a general engagement ensued…it was now dark & we were fighting by the flash of the enemy’s guns fighting us on 3 sides & had set the prairie on fire in half a dozen places affording the men light to fight by. [We] were obliged to fall back… the enemy tried to turn our left flank in heavy force but Col. Cooper with his Choctaws met them & a bloody fight of 15 minutes turned them back. We fell back about 2 mile and camped having suffered the loss of Capt. [Charles] Stuart & J. Crow, a lad of 16, Jas. 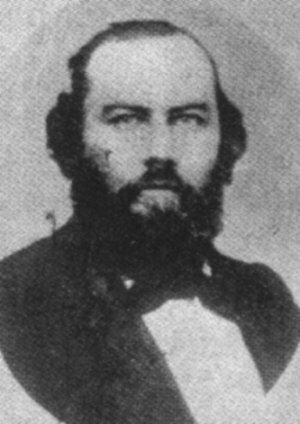 Jackson, E. Reed killed. We rode out on a high prairie, at a distance of 400 or 600 yards there were some small creeks with lower lands on which there was some timber, where the prairie appeared to be shut in by the streams coming together, forming a landscape view that would be represented by a sharp letter V. The company was ordered front into line and from this position could see the smoke as it rose from the camp of the enemy. Capt. Stuart then ordered an advance. Away we went. By some means as if by magic a lone rider managed to fire the prairie several times while on the run – and we close after him. When within 40 yards we received a volley of balls and arrows that were discharged by a hidden enemy, but for our proximity we saw them when they raised up to fire on us. Capt. Stuart gave the command, “left onto line” and as the company dashed into line each man discharged his piece into the half hidden ranks of the enemy. The company was rapidly and nicely forming with good effect when on the extreme left Lt. [James] English called to those on the left to aim left as the Indians were now enfilading our line with severe fire. While Capt. Stuart was firing he was struck in the forehead by a large ball that passed out a little to the left and center of the back of his head. One of our Lieutenants seeing the rapid movements of the enemy, ordered us to retreat and load as retreating. As soon as our guns were loaded, were immediately discharged upon our pursuing enemy who were pepering us with a deadly aim. Old Hathluhola [Opothleyohola] a Creek Indian Chief was supposed he had about 2000 warriors of the Creek Nation and about 1000 women and children and about 500 Jayhawkers, our force was about 2500. We overtaken the enemy just at dusk. Capt. [Charles Stuart’s] company and [M. J. Brinson]’s was marched together which made one squadron. When our squadron came in site of the enemy our Captain formed us in a line for battle. They comminced firing on us they run us in a place where he had no chance to dodge. We was surrounded with creeks except one little space. It was in the shape of a horse shoe nyer than any comparison I can make. The enemy was discharging their guns from every side except where we marched in at. We was compelled to retreat back. We comminced retreating back firing on the enemy until we went about one half mile. Charles [Stuart] called a halt. There he fell to the gound the last words we heard him say was “form on me.” There was two buckshot went in the left side of his head. I fired my gun 3 time before we give back then I continued to discharge my weapon as fast as I could load until I had shot eight times I think. Our loss was 6 men. The losses of the enemy was from 60 to 100. Sick with the measles here am with the train & more of our men taken sick. Col [William B.] Sims with the remainder went on to Col. Cooper who is camped in 25 miles of Porthleholar [Opothleyohola] he has got a large force of Creeks & jayhawkers from Kansas. I was with our boys on a scout & we struck sign of Portheleholar we followed him, we come on him in the evening a part of our men attacked him, apart had halted. I with them. Noise come from the heroes we started to assist them it being dark and our men greatly out numbered our men retreated back missing us leaving us to the right some 300 yards. Major [N.B.] Towns would not let us go saying we would not know who we was firing on. At this moment was fired on by our men we was greatly confused. Giving them our password, Texas, they ran off in the dark. I felt very much like shooting after I was shot at. Next morning we went to their camp finding 15 or 17 wagons, 8 yoke of oxen and many ponies all abandoned, the wagons were all burned. We found stricnine in beef & corn & 2 men who had been taken prisoner tied and beat to death. Capt. Charles Stuart and Pvts. John Crow, John Reed, John Jackson, Texas Cavalry Battalion CSA, and Pvt. Smith and one unnamed man, Creek Regiment CSA, were reported killed in action. Pvts. W. J. Little, John Freid, Texas Regiment CSA, and Pvts. Daniel Cox and Smith, Creek Regiment CSA, were reported wounded. The Honey Springs Battlefield Park in Oklahoma may become a new addition to the National Park Service, the Tulsa World reports. The U.S. Department of the Interior said in a report that there’s “potential action” for “support designation of Honey Springs as a National Battlefield Park.” Now Oklahoma history buffs are scratching their heads over just what that means. The Tulsa World couldn’t get an answer.Hopefully that government-speak translates into real action. The Battle of Honey Springs was the largest Civil War battle in Oklahoma, which was the Indian Territory back then. The battle was notable in that white soldiers were a minority on both sides. 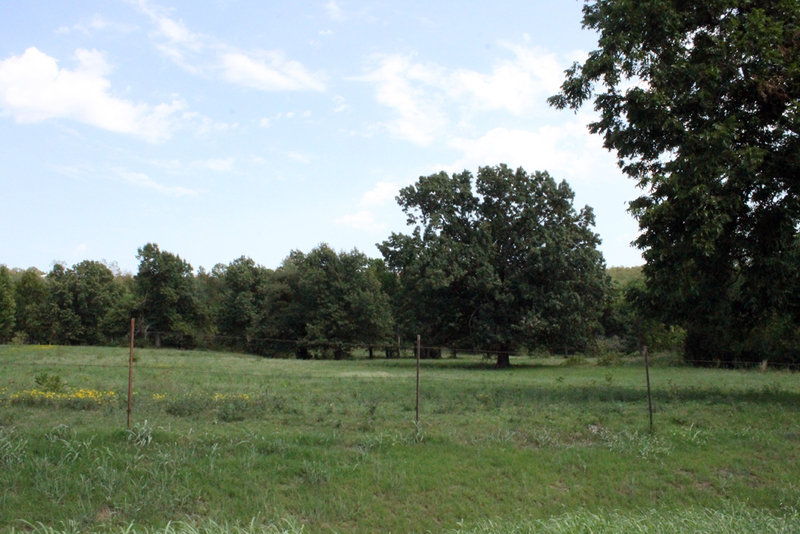 On July 17, 1863, a Confederate army was gathering at Honey Springs in order to attack the Union position at Fort Gibson. 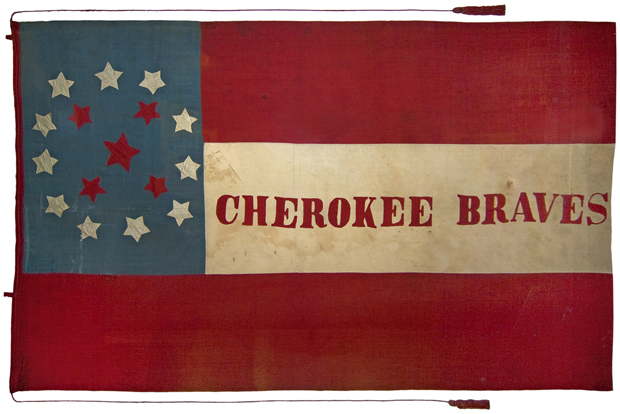 About four or five thousand rebels had assembled, mostly Cherokee, Choctaw and Chickasaw. More reinforcements were coming, so the Union troops at Fort Gibson, which only numbered 2,800, decided to attack before it was too late. The Union side was mostly black and Indian troops, some from the same tribes as the rebels. After a night march, the Union army attacked the Confederate position in a pouring rain. The rain ruined much of the rebel gunpowder, and this helped decide the battle. Nonetheless there was enough powder left for the rebels to put up a hard resistance. After a few hours they were forced to retreat, having to burn part of their wagon train to keep it out of Union hands. The Confederates lost 150 men killed, 400 wounded, and 77 taken prisoner. The Union lost only 17 killed and 60 wounded. The rebels lost control of the Indian Territory north of the Arkansas River. This helped open up Arkansas for invasion and led to a Union army capturing Little Rock that September. Prominent in the fight on the Union side was the First Kansas Colored Volunteers, a black unit of mostly escaped slaves that was the first American black regiment to see combat when they defeated a larger force of rebel guerrillas at the Battle of Island Mound in Missouri on October 29, 1862. The victory made headlines across the country and helped dispel a widespread belief that black soldiers wouldn’t fight. The First Kansas Colored Volunteers fought in several engagements in Missouri, Kansas, and Arkansas yet they aren’t very well known. The justly famous 54th Massachusetts has inspired books, a monument, a movie, even a rap video, but the First Kansas remains largely forgotten. I’ve been sending a book proposal on the regiment around to publishers for a few years now, and despite being an established Civil War author I keep getting told there’s an “insufficient market” for the subject. Apparently the American public can only deal with one group of black heroes at a time. Here’s hoping the Honey Springs battlefield will become a National Park and the First Kansas will get some of the recognition they deserve. Thanks to Jane Johansson over at the The Trans-Mississippian blog for bringing this to my attention. Jane blogs about all aspects of the Civil War west of the Mississippi and is worth reading. Ball’s Bluff was a small battle by the standards of the Civil War, but it had ramifications far beyond its size. It was only the second significant battle in the east, and received a great deal of attention in both North and South. Edward Baker, a senator from Oregon and close personal friend and political ally of President Lincoln, was killed during the battle and became a martyr to those who took a hard line against the Confederacy. Perhaps most importantly, the defeat spurred the creation of the Joint Committee on the Conduct of the War by Congress; the Committee became a persecutor of those who were considered to be soft on defeating the Confederacy and destroying slavery. George McClellan took command of Union forces around Washington, D.C., in the wake of the defeat at Bull Run in July 1861. He immediately set about training and improving the state of his army. As the good campaigning weather of fall 1861 passed, however, he began to feel pressure to advance on the Rebel forces just across the Potomac River from Washington. Probes and raids by Yankee forces over the Potomac combined intelligence gathering with training. On 19 October McClellan ordered General George McCall to conduct a reconnaissance toward the village of Dranesville, Virginia, covering a topographical survey of the area. 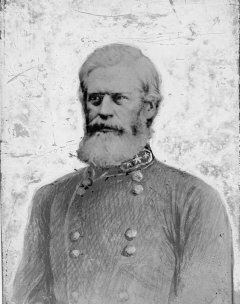 McClellan alerted neighboring commander General Charles P. Stone of the movement and told him to keep a vigilant watch on the town of Leesburg; if the Rebels evacuated it, he could move in. A “light demonstration’ on Stone’s part would help move them on. Stone moved one brigade to the Potomac opposite Leesburg. When an inexperienced scouting party crossed into Virginia during the night of 20 October, it mistook shadows for an unguarded Confederate camp. Stone ordered Colonel Charles Devens and 300 men to make a dawn attack. If no other Confederate forces were found, Devens was to stay on the Virginia side and conduct a further reconnaissance. When Devens found no camp, he pushed on to Leesburg, which he found empty of enemy troops. Devens requested reinforcements so that he could hold Leesburg. When Stone ordered additional troops to join Devens, only three boats were available to ferry soldiers to the Virginia side and so movement was slow. Colonel Edward Baker was ordered to take command of the larger force, totaling 1,640 men. Baker was an inexperienced soldier, but he was also an old Illinois friend of President Abraham Lincoln. Lincoln, in fact, had named his second son after Baker. After he had moved west, Baker was elected senator from Oregon. He had turned down a commission as brigadier general, because it would require his resignation from the Senate. An outspoken enemy of any who would compromise with the slaveholding South, he looked forward to an opportunity to prove his point in battle. Baker ordered his men to form a line of battle in a clearing near the river. Immediately in the rear of his position was 100-foot Ball’s Bluff; a single narrow path led down to the Potomac. More experienced officers worried about a wooded ridge immediately in front of Baker’s line. Confederates on that height would be able to shoot down at the Union soldiers in the clearing below. Actually, Confederate units under the command of Colonel Nathan “Shanks” Evans were slowly arriving on the battlefield and exchanging shots with the Yankees. At 3:00 p.m. the Confederates launched a general assault on the four regiments at Ball’s Bluff. Soon, Evans’s 1,600 Rebel soldiers in wooded cover were pouring shot into Baker’s forces in the open. For three and one-half hours, the Union soldiers held on. Baker was killed around 5:00 p.m. Unable to stand the fire and unable to retreat in an orderly manner, the Yankee formation began to crumble. 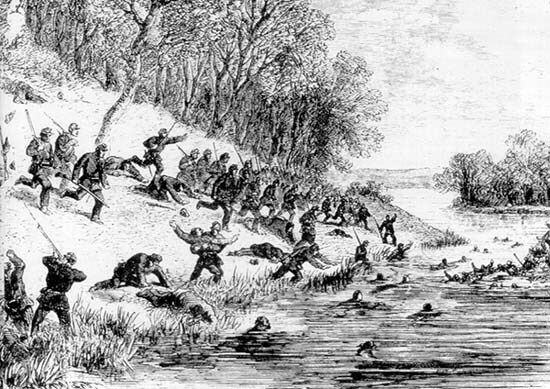 Some leaped off the bluff in an attempt to reach the river, and many were killed or injured by the fall. Others climbed safely down Ball’s Bluff, but the few boats were swamped by the numbers trying to regain the Maryland side. As the Confederates fired down from the top of the bluff, boats sank and scores drowned in the river. By 7:00 p.m. the battle was virtually over and most Federal survivors were prisoners. Union losses totaled 49 killed, 158 wounded, and 714 captured or wounded. Confederate casualties amounted to 33 killed, 115 wounded, and one man missing. The obvious disparity in losses was clear to all and trumpeted by the Confederates, while the defeat having occurred so near to Washington ensured that newspaper reporters would quickly spread the news to the rest of the country. The effects were quickly felt in the north. For Lincoln, Baker’s death was a personal blow. When informed, Lincoln stood stunning and silent for several minutes. He walked slowly back to the executive mansion with bystanders noting tears rolling down his face. Baker was buried in a state funeral attended by the president, vice president, congressional leaders, and the Supreme Court. He immediately became a martyr to the cause of the Union, despite the fact that his inexperience had contributed to the disaster. Nonetheless, the political establishment was intent on discovering darker motives for the disaster. Although many regular officers blamed Baker, Republicans who favored a hard war policy and the destruction of slavery blamed McClellan and Stone. On 20 December, Congress created the Joint Committee on the Conduct of the War. Representatives from both the Senate and the House of Representatives thus formed a permanent committee to inquire into and investigate how the war was being directed. Investigations were conducted in secret, and the committee was soon persecuting those suspected of having Southern sympathies. Their first victim was General Charles P. Stone. Witnesses denounced Stone, alleging that he secretly communicated with unnamed Southerners and returned runaway slaves to their owners. He was also blamed for failing to reinforce Baker at Ball’s Bluff. The Committee took their findings to Secretary of War Edwin M. Stanton, who ordered Stone relieved of command and arrested on 8 February 1862. Stone was never tried, but enough testimony was released to the newspapers to paint him as a traitor. Stone was released from prison in August 1862, and though he served again, his military career was virtually at an end. Stone’s experience remained an example and warning to Union commanders throughout the remainder of the war. The U.S. Army has a detailed look at the Battle of Ball’s Bluff that was published previously as Ball’s Bluff: An Overview and is now on line. You can find that here. The Civil War Trust has a webpage dedicated to the Battle of Ball’s Bluff with additional resources, including recent efforts to preserve the historic battlefield from development encroachment. You and find their Ball’s Bluff page here. 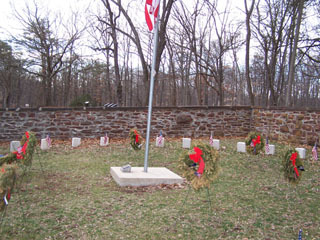 The Balls’ Bluff National Cemetery contains 25 burial plots containing the remains of 54 soldiers. Only one, plot #13, is identified as James Allen, a soldier from the 15th Massachusetts Volunteer Infantry. The Northern Virginia Regional Park Authority began its Ball’s Bluff Battlefield Restoration program in 2004, to restore the park’s appearance to what it looked like in 1861. You can find more information about those efforts here. You can read a brief biography of Senator-Colonel Edward Dickinson Baker here. Farwell, Byron. Ball’s Bluff: A small Battle and Its Long Shadow (1990). Grimsley, Mark. “The Definition of Disaster.” Civil War Times Illustrated (1989). Holien, Kim Bernard. Battle at Ball’s Bluff (1985). Stears, Stephen W. “The Ordeal of General Stone.” MHQ: The Quarterly Journal of Military History (1995). Tap, Bruce. Over Lincoln’s Shoulder: The Committee on the Conduct of the War (1998). 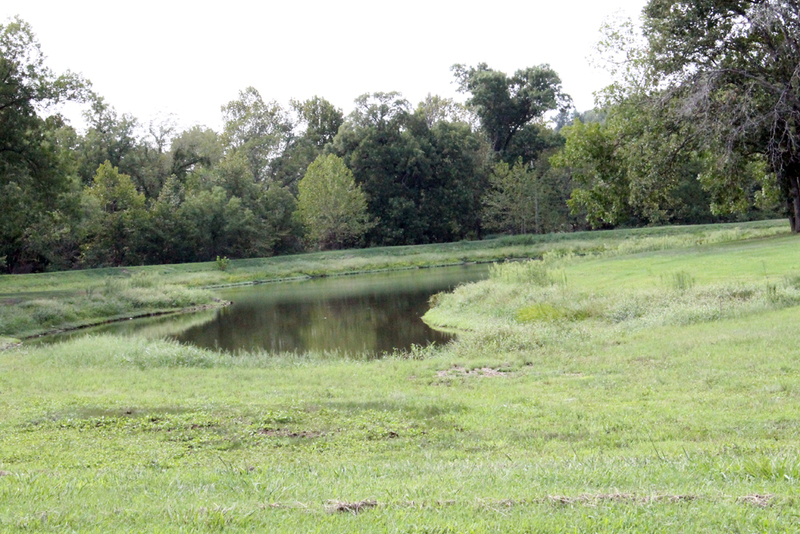 A new 5,000 square-foot visitor center could be in place at the Honey Springs battlefield in time for the 150th anniversary of the Civil War battle. On Monday, the U.S. Department of Agriculture Rural Development announced a $1.9 million public-private partnership that includes the Oklahoma Historical Society, McIntosh County and an area nonprofit organization. Oklahoma Historical Society Director Bob Blackburn said the USDA will fund $500,000 through a grant and $600,000 through a 40-year, 4 percent loan to be repaid by the Friends of Honey Springs Battlefield. The rest of the funds will come from cash on hand or money to be raised by the Oklahoma Historical Society. Blackburn said the visitor center would be four miles north of Interstate 40 and one mile east of U.S. 69. From U.S. 69, it will be accessible from the Rentiesville or Oktaha exits, he said. 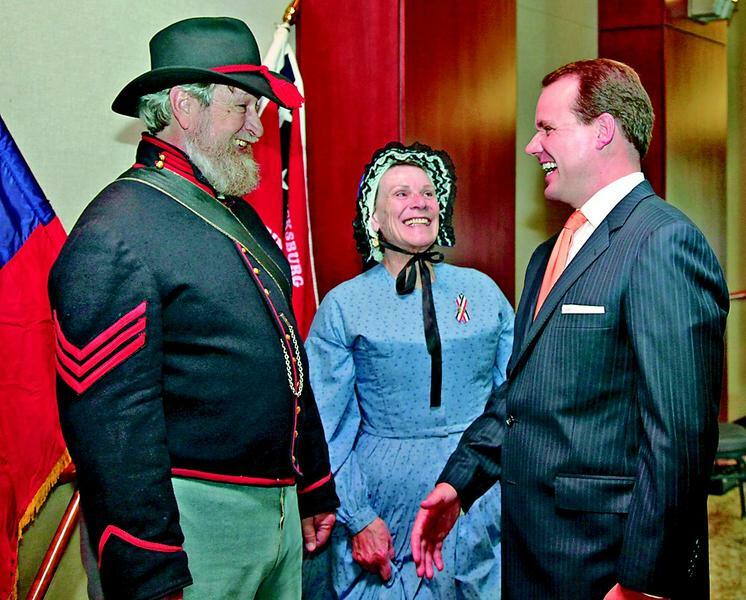 The visitor center could help the area benefit from Civil War-related tourism. The site could attract up to 100,000 visitors a year, Blackburn said. However, Checotah resident Emmy Stidham, newly elected president of the Oklahoma Historical Society board, said officials expect 150,000 visitors and $9 million in tourism revenue. The Engagement at Honey Springs — July 17, 1863 — was the largest of more than 107 documented hostile encounters in Indian Territory during the Civil War, according to the Oklahoma Historical Society website. At least 150 men died in the battle, which Blackburn said was critical for Union victory because it paved the way for the occupation of Fort Smith, Ark. 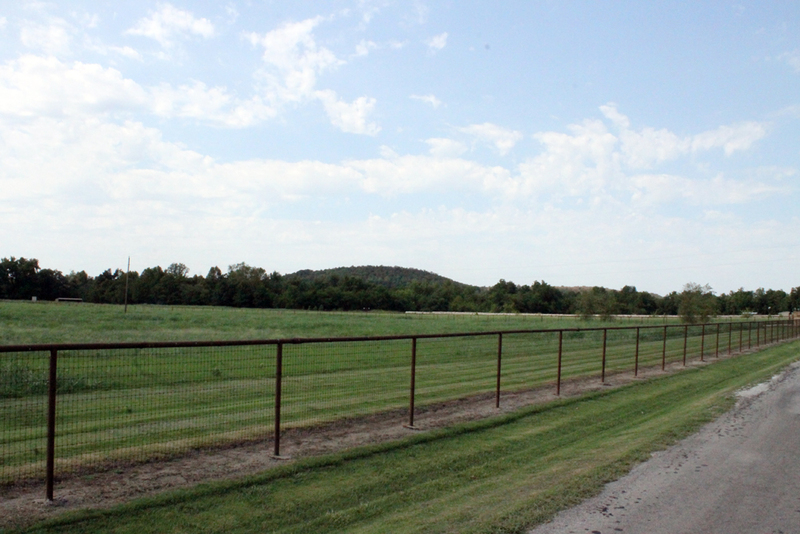 “We also can link Honey Springs to Fort Gibson,” he said. Blackburn said the Historical Society had tried several avenues to fund a new visitor center in time for the battle’s 150th anniversary, July 17, 2013. He said they found a good contact with Ryan McMullen, state director of USDA Rural Development. Blackburn said McMullen had a keen interest in Civil War history and helped secure the USDA funding. Blackburn said architects are designing the visitor center “right now,” and ground could be broken by January. Some Honey Springs re-enactments bring several thousand people to Checotah, said Lloyd Jernigan, executive director of the Checotah Chamber of Commerce. He said he welcomes a new visitor center for the site. “Now, we have a visitor center in a doublewide trailer,” Jernigan said. 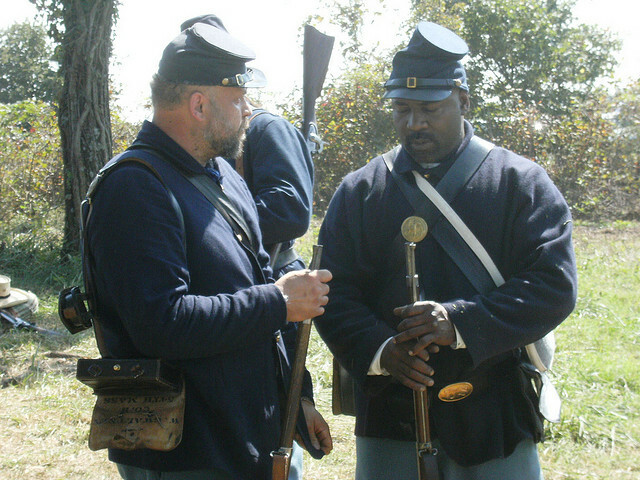 A Civil War re-enactment held late last April drew 3,000 to 3,500 people to Checotah, he said. Reach Cathy Spaulding at (918) 684-2928 or cspaulding@muskogeephoenix.com. Click here for a description of the battle.